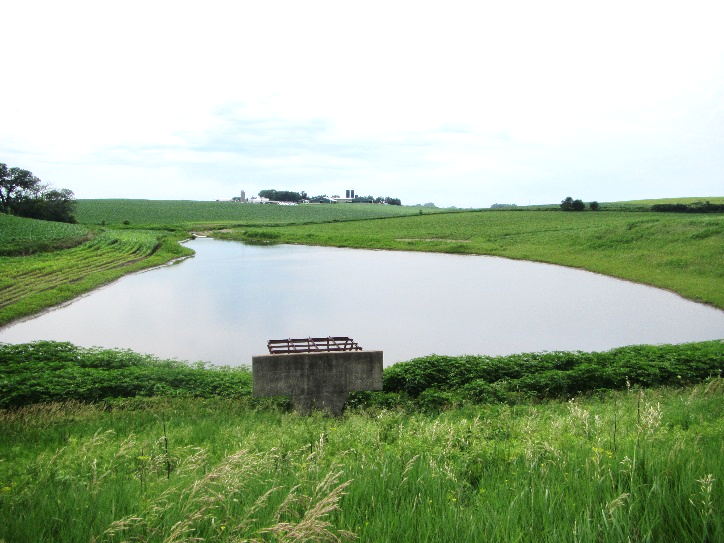 New life has been restored to a 1950s era flood retention structure (E3) in the Crystal Creek Watershed. Utilizing funding from a targeted watershed grant by the Board of Water and Soil Resources and technical assistance from the SE Technical Joint Powers Board and Fillmore Soil and Water Conservation District, 20,000 cubic yards (28,000 tons) of deposited sediment was removed during a three-week period in December 2017. The project is expected to extend the sediment trapping benefits for an additional 30 to 50 years. The excavated sediment was placed back on surrounding farm fields. 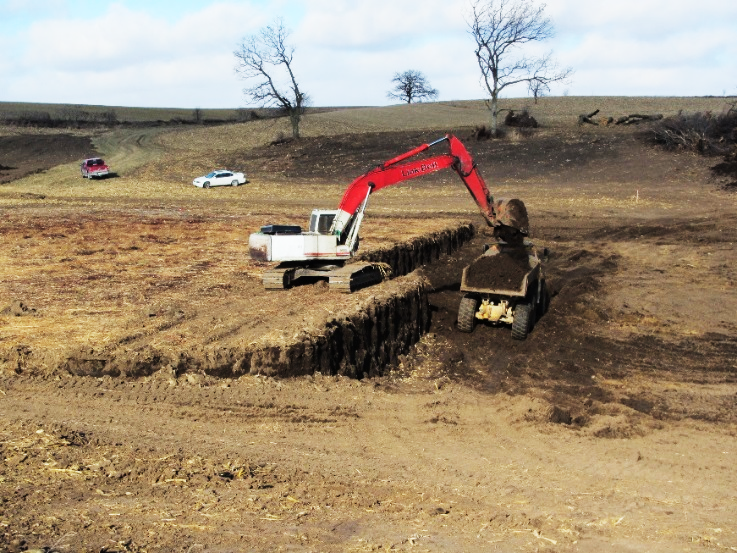 To enhance upland treatment and prolong the benefits of the clean out, 25,000 feet of new and repaired grass waterways were installed by the watershed farmers. A Sentence to Serve crew from Preston helped remove the over-grown brush and small trees from the earthen dike. The black and white picture above shows the E3 structure one year after construction in 1955. The adjacent image shows the four-acre pool area filled with topsoil in 2013. This picture taken in early December of 2017 shows the excavation of nearly 60 years of top soil, up to nine feet deep, within the structure pool area. Six months after the clean-out (June 28, 2018), the structure was slowly releasing runoff water after a June thunderstorm. Over the past sixty years, topsoil loss from the upper half of the watershed had displaced the pool area. This has had little effect on diminishing the flood-control benefits, but has significantly reduced sediment and nutrient trapping efficiency from an estimated 80% to 20%. With the project complete, the efficiency has been restored back to its original design and it is estimated that on average an additional 170 tons of soil, 1,380 pounds of nitrogen, and 350 pounds of phosphorus will be stored on an annual basis. Sediment surveys will be conducted in the pool area on a routine basis to quantify actual sediment delivery rates and trapping efficiency. This project was considered a high priority for the watershed study because 45% of the watershed drains to this area. The structure has the capacity to store 23 million gallons of runoff at the principal and nearly 70 million gallons at the emergency spillway. Estimates indicate flood retention structures like E3 can help reduce peak flow runoff volume during 10, 50 and 100-year rainfall storm events by up to 25% (MDNR HMS Modeling, 2016) help reduce potential flooding impacts within the watershed and downstream communities like Preston. The cumulative effect of flood retention could also reduce streambank erosion on the main stem of the Root River. A 2016 sediment source study (Belmont, 2016) estimated that streambank erosion accounts for over 40% of the sediment load at the outlet of the Root River. The study found that Root River sediment concentrations increase with river flow at a greater rate than almost any other river in Minnesota due to the many large, accessible and easily erodible streambanks (http://water-research-library.mda.state.mn.us/pages/application/filedownload.xhtml?recId=243800) Maintaining structures like E3 could be a very important practice to help attain cost-effective water quality goals. To learn about other water quality projects taking place in the Root River Field to Stream Partnership study, visit www.mda.state.mn.us/rrfsp.